I was in a bunch of pitch meetings lately and I thought I may share something that few of us admit. We're not 100%. It's a newsflash, I know! My dad (along with generations of dads before him, and yours) said that you never stop learning. Another newsflash. 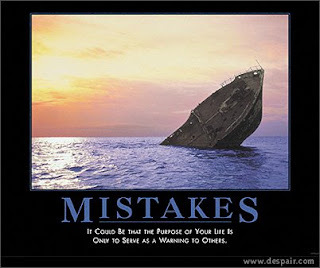 One of my partners did a great pitch this week and on our way back all he did was rail on himself about his mistakes. If you are in sales, media, marketing, promotions, public relations, packaged goods, or even in every day work with colleagues - you don't hit a grand slam every time. I love social networking because I have met so many cool interesting people doing great work. What is celebrated through this space is victories and ideas and people share articles and tips. I don't read a lot of posts from people kicking themselves. That's a good thing! That's what we all should do - even when we think "the pitch" didn't go our way. I have been around sales people my entire career and for some strange reason they all feel that every client pitch will end in a sale. Of course you have to prepare, find the needs, work on the solutions, partner with your client but it won't always go your way. The problem with working around other creative people is that we are WAY too hard on ourselves. I wouldn't have it any other way! Was that okay? I know, it could've been better.